The SZALAY CYTO-SPATULA improves the quality of Pap tests and significantly minimizes the number of false-negative Pap smears. If applied carefully, it is faster, cheaper and better than all other Pap test methods. Although not necessary, the SZALAY-CYTO-SPATULA Plus can easily be combined with liquid based methods. The SZALAY CYTO-SPATULA has been developed to obtain the best quality of Pap smears. It has been used extensively in Germany, Austria and Switzerland for more than ten years. If used properly, the SZALAY CYTO-SPATULA improves the quality of Pap smears to such an extent that most cervical carcinomas can be detected very early. The SZALAY CYTO-SPATULA is an extended-tip spatula and available in different sizes and shapes to fit the form of the cervix and the size of a patient’s cervical canal. Thus, no need for different sampling devices to obtain cells from the different areas. There are always enough well- preserved cells from the endocervix, ectocervix and the endo-ectocervical area contained in a smear made with the SZALAY CYTO-SPATULA. Compared with other Pap test sampling devices, the SZALAY CYTO-SPATULA scrapes off the possibly keratinizing superficial cell layers which may cover abnormal tissue areas. Due to its specially designed surface, cells are also collected from deeper layers. Compared with similar instruments or newer Pap test methods, a SZALAY CYTO-SPATULA Pap test is cheaper, faster and at least as reliable. Although not necessary, the SZALAY-CYTO-SPATULA Plus can easily be combined with liquid based methods. One smear made with the SZALAY-CYTO-SPATULA is up to the standard for diagnosis in the new BETHESDA SYSTEM (USA 1989). The SZALAY-CYTO-SPATULA keeps the sample site identified and thus makes it possible to identify the site of the lesion for subsequent colposcopy and biopsy. CYTOLOGY OF THE UTERINE L. Szalay. This book contains more than 700 colored images of smears made with the Szalay Cyto-Spatula. GYNÄKOZYTOLOGIE: J. Jenny, Einführung in die gynäkologische Zytodiagnostik. The last few decades have not produced an universally accepted method for taking a smear. This is due to the fact that none of the implements devised to date allow a l00 % detection rate of cervical carcinoma or its precursors. In the United States and Western Europe the various spatulas based on Ayre's spatula are popular. None of the spatulas, however , has achieved the diagnostic yield desired. Study of the histopathologic changes in the cervix reveals those abnormalities and factors which hinder or indeed prevent accurate sampling. The ectocervix is visualized by the gynecologist. Many lesions can be localized by the colposcope but a large part of the endocervix is out of colposcopic range. Obtaining of smears with the cotton-tipped applicator from the endocervix is possible only when the diameter of the external os and cervical canal allow its passage. During the last two decades the local destructive therapy of ectocervical intraepithelial lesions has gained a wide acceptance (electrocoagulation, diathermy , cryo therapy and laser therapy). Partly as a consequence of this the squamo-columnar junction, which plays such a seminal role in the genesis of cervical carcinoma, is often relocated in the canal, as in the postmenopausal woman. Traditional cytologic sampling results in smears composed of cells which have exfoliated from the most superficial layer of the epithelium. In some cases of high grade squamous intraepithelial lesion and invasive carcinoma special stains (Krutsay) reveal superficial keratinization which on occasion may form thick hyperkeratotic plaques. These not only prevent the spontaneous exfoliation of underlying neoplastic cells, but also form impermeable barriers for the cotton-tipped applicator, so that procuring of neoplastic cells becomes impossible (Figs. 7, 9). The superficial layer in many cases of squamous intraepithelial lesions is parakeratotic. Although such cells exfoliate, the more deeply situated neoplastic cells will not appear in the smear (Fig. 8). The metabolic exchange and blood supply of the superficial portion of invasive carcinomas are precarious. This results in extensive cellular degeneration and necrosis. The covering necrotic blanket makes the deeper lying neoplastic cells unavailable for examination. Hence the relatively frequent false negative smears in cases of invasive carcinoma. Adenocarcinoma is even more prone to rapid autolysis and necrosis than squamous cell carcinoma. The surface of adenocarcinoma of the cervix which usually arises in the canal, tends to be necrotic and covered by mucus. Herein lies the explanation of the relatively infrequent detection of adenocarcinoma in situ and early invasive adenocarcinoma of the cervix (Fig. 11). The surface epithelium covering cervical polyps may be normal but the glands underneath may have undergone neoplastic transformation. As a rule, spontaneously exfoliated cells in such cases are normal (Fig. 10). The author of this atlas has also experienced several times the frustrating false negative smear. This stimulated the development of an improved spatula for smear taking. The new spatula devised differs in several aspects from its predecessors. The surface area of the ectocervix and the diameter and the length of the cervical canal differ between the nullipara and parous woman. Therefore a variety of spatulas were designed from which one of suitable size and shape may be chosen according to individual requirement. 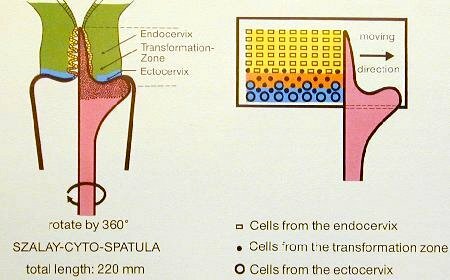 Since spontaneously exfoliated cells are not always representative of the whole lesion, rendering the surface of each spatula roughly allows removal of parakeratotic, hyperkeratotic and necrotic layers and ensures sampling of the underlying neoplastic cells. 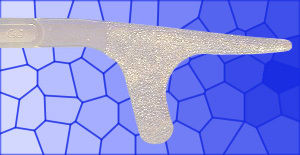 The elongated 'tongue' of the spatula ensures adequate scraping of the endocervical canal. After insertion of the speculum the surface of the ectocervix is cleansed with a cotton swab and any mucus and debris removed (Figs. 13-14). The correct spatula is chosen for the individual (Fig. .15). The 'tongue' of the spatula is introduced into the canal, whilst its 'shoulder' is positioned on the 3 o'clock position of the ectocervix at the beginning of the procedure (Fig. 16). The cells are spread on the slide always along its long axis, parallel to its edges. If the distribution of the cellular material is uneven, the same spatula may be used for respreading (Figs. 21-22). The slide is immediately fixed (Fig. 23). Abnormal cells taking up a position on the upper portion of the slide are assumed to derive from the tongue of the spatula (Fig. 24). Abnormal cells which are found on the lower third of the smear represent those obtained by the shoulder of the spatula (fig. 25). Even distribution of abnormal cells throughout the slide reflects simultaneous ecto- and endocervical disease (Fig. 26). Correct use of the spatula and even spreading of the smear enables the cytologist to pin-point lesions as ecto- or endocervical from the distribution of the abnormal cells on the slide with surprising accuracy, even in the absence of clinical information. This is especially important for ectocervical lesions, as in such cases COLPOSCOPIC examination is negative. Consequently the cytologist can provide valuable information to the clinician as to the type of biopsy required for definitive diagnosis. Using the SZALAY-CYTO-SPATULA, only a single invasive endocervical carcinoma went undetected among 150.000 smears taken (Figs. 713-718). Contact bleeding in 2-3% of cases may interfere with subsequent colposcopic examination. However, blood cells in the sample are no problem for the cytologist. If the patient is duly forewarned, mild spotting for 1-2 days will not be unduly worrisome. If your browser does not support frames you ended up on this page. You can access the different frameless pages below.